If you’re looking for a way to use all that leftover turkey from Thanksgiving, these Leftover Turkey Nachos might be just what you need! Crispy Mission® Triangles Tortilla Chips topped with turkey carnitas, cranberry sauce salsa, Brussels sprouts and lots of cheese. Oh, it doesn’t get better than that! There’s something y’all need to know about me. I am crazy about Thanksgiving! I go all in, making everything from scratch and I’m pretty darn proud of it. We only eat Thanksgiving food once a year, so it has to be special and delicious. Thanksgiving leftovers, though? Meh! There’s something about microwaved turkey that makes me want to gag. So, every year, I try to be creative and come up with new ways to use those leftovers. One of my favorites is to transform it all into nachos! You get to use the turkey, the cranberry sauce and the Brussels sprouts (if you have them). It might look/sound like there is a lot going on… until you try it! It’s an explosion of flavors and textures. Sweet, salty, mildly spicy, tangy, you name it! Oh, and cheesy! There simply can’t be nachos without cheese! The beauty of this recipe is that it uses Thanksgiving leftovers that can be frozen. 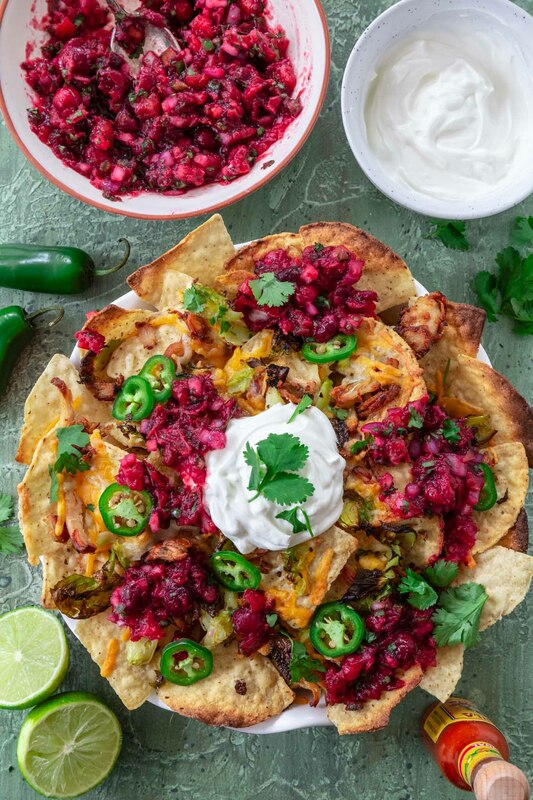 So come Christmas time (or any football weekend), you can defrost your frozen leftover turkey and cranberry sauce and make these turkey nachos as an appetizer! 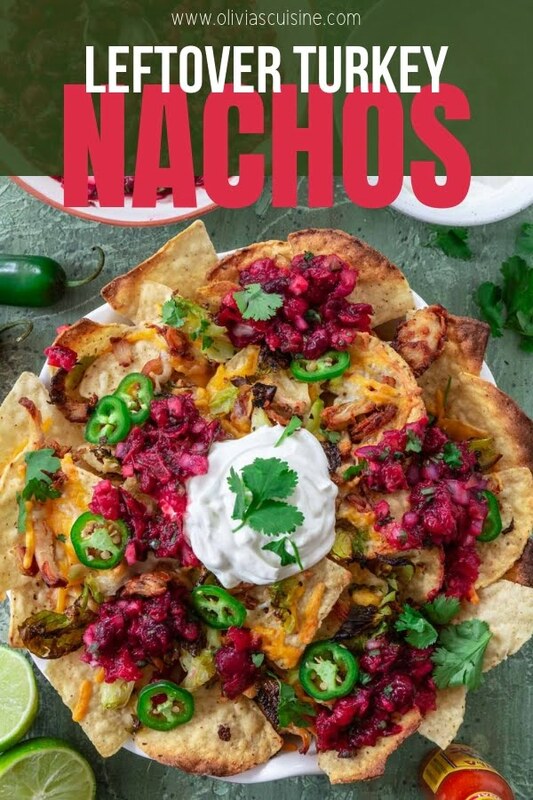 And, if you happen to crave these nachos in June or July when you don’t have leftover turkey on hand, you can always make them with rotisserie chicken instead. Turkey carnitas? Turknitas? Don’t worry, that’s just a silly name for crispy browned turkey shreds! I got the idea from Serious Eats. I decided to forego the boiling and just fried the shredded turkey in hot oil! If you have leftover turkey fat, that’d be even better. Kenji recommends using a non-stick or cast iron skillet, cause you want the sticky bits to cling to the turkey, not the pan. As for what type of meat to use, I say use whatever you have on hand. Chances are that will be dark meat, but white meat works too! Next time I make this, I’ll probably shred the turkey a little more. I left it chunky and therefore it didn’t get as crispy as I’d like! For me, when carnitas are concerned, the crispier the better! Even so, they were lip-smacking delicious! It was hard to keep my husband from eating the turkey carnitas straight out of the pan so I could use them for the leftover turkey nachos. I bet he wishes he didn’t stuff himself on Thanksgiving in order to have more leftover turkey for carnitas! When I first envisioned this recipe, I thought the turkey would be the star of the show. And as much as I like the browned turkey carnitas, the cranberry sauce salsa paired with Mission Triangles Tortilla Chips really exceeded my expectations! All I did was mix the cranberry sauce (I make a killer sauce with bourbon, cinnamon, brown sugar and orange zest and orange juice) with the usual salsa suspects: red onion, jalapeños, garlic, tomatoes, lime zest and lime juice. If you want to kick it up a notch, a few dashes of hot sauce can be added. It’s sweet and tangy, with a bit of a bite (customizable if you like it hot!). And it really elevates the nachos, pairing well with the turkey and the cheese! And, let’s face it, you would probably be tossing all that leftover cranberry sauce as there’s always so much left and not much to do with it. In fact, I’d advise you to make extra! I guarantee you will want to eat it over and over again. I’m a bit of a nachos snob, so believe me when I say that the first rule of making good nachos is to choose good quality tortilla chips. You want something thick and sturdy enough, so you can pile on the toppings, but also crispy, cause nachos should always have a crunch! I also have a preference for corn tortillas, as I find they have more flavor, but go for flour if you prefer. 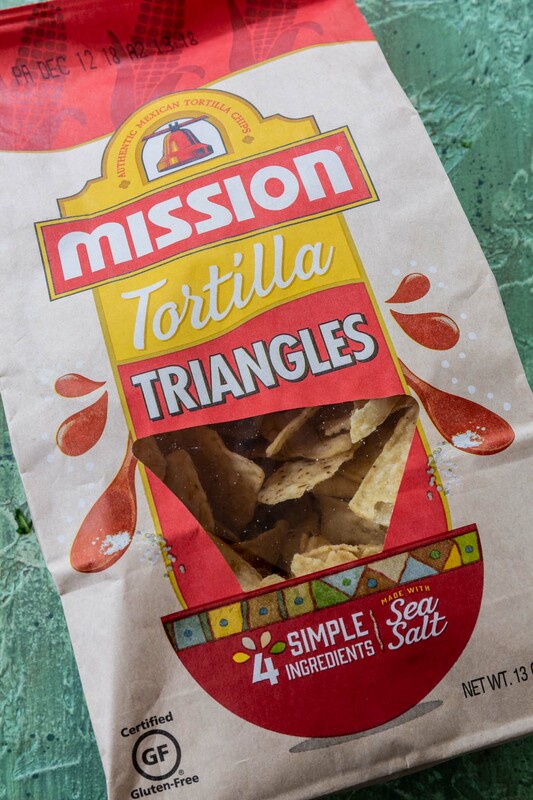 My go-to brand is Mission Tortilla Chips; the ones in that pretty brown bag. I find that they taste just like restaurant-style freshly made chips! Plus, they only use four simple, wholesome ingredients, including whole kernel corn and sea salt, to provide that made-from-scratch flavor we all love! There are no artificial flavors or colors here. And, if you can’t eat or avoid gluten, they are certified gluten free. I guess you could make your own tortilla chips, but why bother when Mission is so much better? You can check out their website here for more recipe inspiration and for a store locator! As for the other toppings, you can go with as little or as much as you’d like! I chose leftover Brussels sprouts, jalapeños, sour cream and a touch of cilantro. No guacamole, as I thought it already had enough going on. A squeeze of lime right before serving really brings out the flavor of the turkey carnitas! And you can serve with hot sauce on the side for those daredevils who can’t get enough of spicy food. Heat the oil (or drippings) in a large nonstick or cast iron skilled, over medium high heat, until shimmering. Add the shredded turkey, spreading into a single layer, and cook without stirring, for about 5 minutes or until browned and crispy. 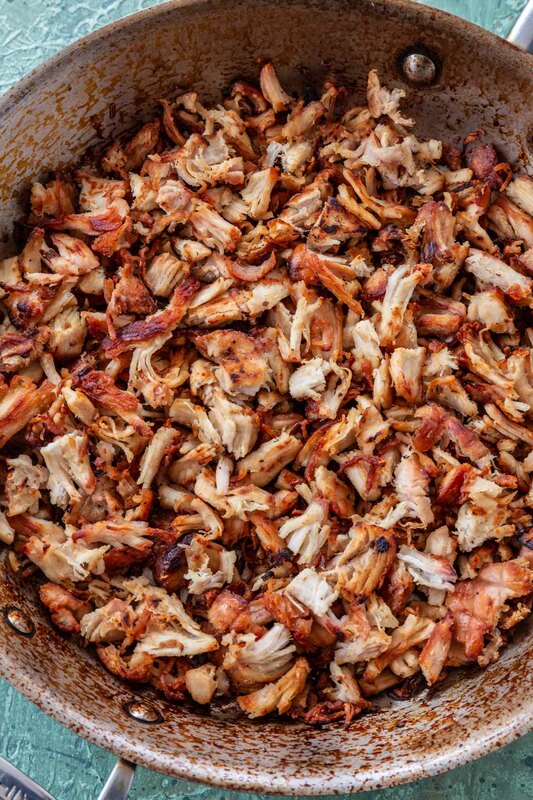 Stir and continue cooking until the turkey carnitas as as crisp as you like. Season with salt and reserve. Combine the chopped onion, garlic, tomatoes, jalapeño, cranberry sauce, lime juice and zest and cilantro in a medium bowl. Season with salt and reserve. Spread half of the chips on a large cast iron, oven proof dish or baking sheet. Add half the turkey carnitas, Brussels sprouts (if using), 1/2 cup of cheddar and 1/2 cup of Monterey Jack. Top with the remaining chips, turkey carnitas, cheese and Brussels sprouts. Bake until the cheese is melted and chips are toasted, about 10 minutes. Top with the cranberry sauce salsa, sliced jalapeños, cilantro and a dollop of sour cream. Serve immediately, squeezing some lime juice on top if desired. Make sure to check out the Mission website here for more recipe inspiration and for a store locator to find Mission Tortilla Chips!